Gallium Oxide: Technology, Devices and Applications discusses the wide bandgap semiconductor and its promising applications in power electronics, solar blind UV detectors, and in extreme environment electronics. 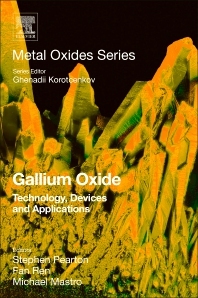 It also covers the fundamental science of gallium oxide, providing an in-depth look at the most relevant properties of this materials system. High quality bulk Ga2O3 is now commercially available from several sources and n-type epi structures are also coming onto the market. As researchers are focused on creating new complex structures, the book addresses the latest processing and synthesis methods. Chapters are designed to give readers a complete picture of the Ga2O3 field and the area of devices based on Ga2O3, from their theoretical simulation, to fabrication and application. Steve Pearton is a Professor of Materials Science and Engineering at the University of Florida. Prior to joining the university in 1994 he spent 10 years as a Member of Technical Staff at AT&T Bell Laboratories (now Lucent Technologies) in Murray Hill, NJ. He received his Ph.D. in physics from the University of Tasmania in Australia in 1983 and worked briefly at the Australian Atomic Energy Commission near Sydney prior to spending a year as a postdoctoral research associate at UC Berkeley and Lawrence Berkeley Laboratory. He is author or co-author of approximately 1300 journal articles, has given over 250 invited talks at international conferences, and has authored or edited 10 books. Fan Ren was responsible for high-speed device development in the compound semiconductor area at Bell Labs prior to joining UF in 1998. He has over 22 years’ experience in device fabrication of state-of-the-art electronic devices. He is a Fellow of IEEE, ECS, SPIE, MRS, APS and AVS. Prof. Ren will be responsible for electrical measurements, dielectric depositions, contact formation and some of the data interpretation. Prof. Ren also has an extensive background in radiation effects and in the development of wide bandgap materials and devices and demonstrated the first Ga2O3/Gd2O3 insulated gate n-channel enhancement-mode InGaAs MOSFET's. Michael Mastro’s research interests are in fabrication and modeling physics of high power transistors as well as light emitting, photonic crystal, plasmonic, metamaterial, and photovoltaic devices, fabrication of nano-structured devices, development of numerical models and neural network algorithms to describe nano-scale semiconductor physics. He is the co-editor of the very popular book “III-V Compound Semiconductors: Integration with Silicon-Based Microelectronics” published by CRC Press. Michael will coordinate our efforts with NRL, help supply samples and facilitate additional characterization of irradiated structures.